the cities of many men and he learned their minds. to save his life and the homecoming of his companions. Odysseus--soldier, sailor, trickster, and everyman--is one of the most recognizable characters in world literature. 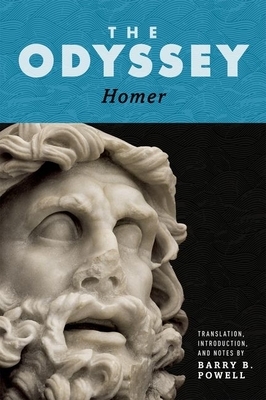 His arduous, ten-year journey home after the Trojan War, the subject of Homer's Odyssey, is the most accessible tale to survive from ancient Greece, and its impact is still felt today across many different cultures. This lively free verse translation, from one of today's leading Homeric scholars, preserves the clarity and simplicity of the original while conveying Odysseus' adventures in a modern style. By avoiding the technical formality of earlier translations, and the colloquial and sometimes exaggerated effects of recent attempts, Barry B. Powell's translation deftly captures the most essential truths of this vital text. Due to his thorough familiarity with the world of Homer and Homeric language, Powell's introduction provides rich historical and literary perspectives on the poem. This volume also includes illustrations from classical artwork, detailed maps, explanatory notes, a timeline, and a glossary. Modern and pleasing to the ear while accurately reflecting the meaning of the original, this Odyssey is a superlative translation for twenty-first-century readers. Barry B. Powell is Halls-Bascomb Professor of Classics Emeritus at the University of Wisconsin, Madison. His translation of The Iliad (2013) was also published by Oxford University Press.